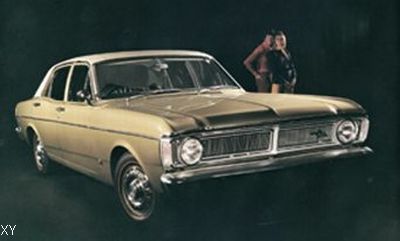 Whereas the previous four ranges of Falcon tended to follow styling trends set by their full size US parent cars, and were marketed with reference to the ‘Thunderbird’, it was decided with the new XR range, which again followed a US design, to capitalise on the phenomenal success of the Mustang. The styling of the car was inspired by the Mustang, copying the coke bottle style line, and the long bonnet and short boot cue, but retaining the traditional round tail lamps. 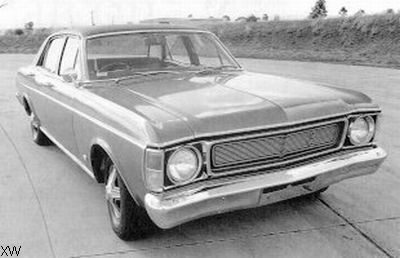 The result was a car that was modern and handsome and while the two door hardtop model disappeared, this was more than compensated for by the arrival, for the first time in the Australian Falcon, of the 289ci (4.7litre) V8 and some serious horsepower. The XR was manufactured between September, 1966 and April, 1968. 87270 were produced. The XT Falcon was a mild restyle of the previous model, with a barely altered grille, but distinctive new tail lamps, circular lamps still, but cut by large rectangular indicator lenses. The V8 engine increased in size to the 302ci (4.9litre) version and there were minor mechanical revisions as Ford placed its Falcon squarely up against it competitors in the marketplace. They were greatly assisted in this with the XTs success in the London-Sydney Marathon rally, where its three entered cars took third, sixth and eighth places, capturing the Team Prize in the process. The XT was manufactured between April, 1968 and July, 1969. 74,394 were produced. The XW represented the first real attempt to more definitely differentiate the Australian Falcon from the styling of its U.S. equivalent. 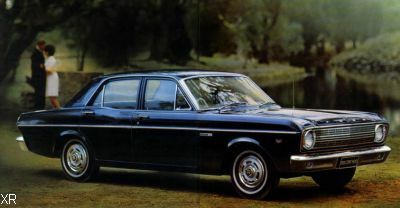 The basic structure remained the same, but the Australian car replaced the traditional round tail lamps once and for all with modern, horizontally split lenses, and introduced a heavier grille, with wrap around indicators and side lights, producing a distinctive and now unique design. Mechanical changes were also made, the most important and impressive being the fitting of the 351ci (5.7litre) V8 engine in various versions, a full 49ci larger than the biggest engine fitted to the U.S. version. The Australian Falcon had finally come of age. The XW was manufactured between July, 1969 and October, 1970. 99,953 were produced. The XY marked the apogee of the second generation Falcons, superior in performance to its competitors, better built, fitted with a range of locally designed six cylinder engines, and in GT form, producing the ultimate and fastest Falcon of them all. Popular with police forces, rental companies and the public at large, the XY featured a new plastic grille split in the centre and revised tail lamps. Improvements were made to the seating, safety equipment and steps were taken to provide a smoother, quieter ride. The available 351ci (5.7litre) engine, while similar in capacity to that fitted to the previous model, was a completely new engine design, more modern and efficient, and when locally produced, would power the Falcon through the next decade. The XY was manufactured between October, 1970 and March, 1972. 100,474 were produced.